Simply push over the rolled fondant / icing, then push the plunger down to emboss the pattern onto it. 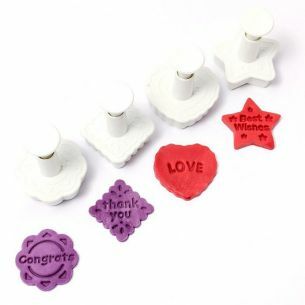 Release and lift to find your cut-out and embossed piece of fondant. These are suitable for food use as well as craft and modelling clays. Please see our store for more great baking items and ideas. 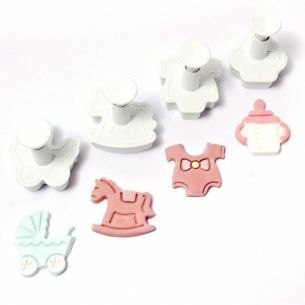 This set of sugar craft plunger cutters has a selection of cute shapes. They make the perfect addition to a 1st birthday cake, or baby shower cupcakes. Who doesn't love afternoon tea? 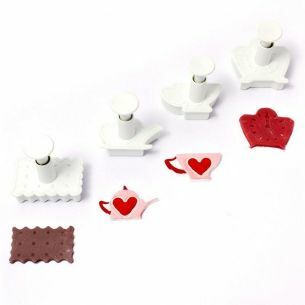 We do here at Yolli, so this tea themed plunger set is just the ticket for topping your fancy cakes. 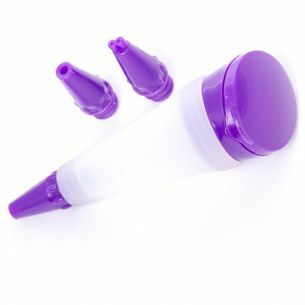 Simply fill the pen with your choice of icing ingredient or our Yolli Melts and give it a little squeeze. Away you go! The messages include, Congrats, Thank You, Love & Best Wishes. Why not paint them with POP Paint for an extra pop of colour? 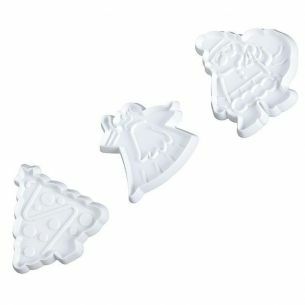 Deck the halls... And your Christmas cake with this set of 3 Christmas fondant cutters. We promise you'll have the most festive Christmas cake in town.